UHI in South Korea – responsible for over half of the warming | Watts Up With That? On average, the total temperature increase over South Korea was about 1.37 °C; the amount of increase caused by the greenhouse effect is approximately 0.60 °C, and the amount caused by urban warming is approximately 0.77 °C. The real test of this would be if North Korea has maintained a surface temperature record that could be compared. Given that they are a closed country, chances are that if it exists. getting it is close to zero. What I wouldn’t give to get it. I wonder if Phil Jones has any? The quantitative values of the urban warming effect over city stations in the Korean peninsula were estimated by using the warming mode of Empirical Orthogonal Function (EOF) analysis of 55 years of temperature data, from 1954 to 2008. The estimated amount of urban warming was verified by applying the multiple linear regression equation with two independent variables: the rate of population growth and the total population. Through the multiple linear regression equation, we obtained a significance level of 0.05% and a coefficient of determination of 0.60. This means that it is somewhat liable to the estimated effects of urbanization, in spite of the settings of some supposition. The cities that show great warming due to urbanization are Daegu, Pohang, Seoul, and Incheon, which show values of about 1.35, 1.17, 1.16, and 1.10 °C, respectively. The areas that showed urban warming less than 0.2 °C are Chupungnyeong and Mokpo. On average, the total temperature increase over South Korea was about 1.37 °C; the amount of increase caused by the greenhouse effect is approximately 0.60 °C, and the amount caused by urban warming is approximately 0.77 °C. There should be a satellite temperature record available for both countries. No doubt, URBAN WARMING especially in winter……but how much does this translate into global values….the Earth is large and round….. While the earth is large and round, most ground measurement stations with a long established record are situated in urban areas that have been built up during the last few decades that coincide with most of the perceived warming. Virtually all stations are situated in the immediate vicinity of settlements as opposed to the open mongolian steppe or on drifting icebergs. How can they be sure that the rest of the heating was due to the Greenhouse effect? Have they ruled out the sun’s contribution? Didn’t the IPCC declare that their models proved that urban warming has only increased by 0.01C over the last century? Korea’s a good test case in part because the cities there have grown so rapidly. Does anyone have a copy of the paper so we can see what the linear regression revealed? According to the Fourth Assessment Report from the IPCC: Studies that have looked at hemispheric and global scales conclude that any urban-related trend is an order of magnitude smaller than decadal and longer time-scale trends evident in the series (e.g., Jones et al., 1990; Peterson et al., 1999). This result could partly be attributed to the omission from the gridded data set of a small number of sites (<1%) with clear urban-related warming trends. In a worldwide set of about 270 stations, Parker (2004, 2006) noted that warming trends in night minimum temperatures over the period 1950 to 2000 were not enhanced on calm nights, which would be the time most likely to be affected by urban warming. Thus, the global land warming trend discussed is very unlikely to be influenced significantly by increasing urbanisation (Parker, 2006). … Accordingly, this assessment adds the same level of urban warming uncertainty as in the TAR: 0.006°C per decade since 1900 for land, and 0.002°C per decade since 1900 for blended land with ocean, as ocean UHI is zero. How do this compares to this study? The chances of Phil Jones having any of N.Koreas surface temperature data and willing to share ? close to zero I suspect. Dont forget, this is a regime run by a collection of totalitarian despots, totally immune to the needs of the people, they exist only to perpetuate their own lust for power and status. Human misery means nothing to these megalomaniacs and the penury of the people matters less. With their pseudo-Marxist philosophy and their mendacious twising of every mundane fact to support their viscious propoganda, they barely deserve the acknowledgement that they exist. I don’t have access to the paper, but I’m willing to bet they are using min/max temperatures, most of the warming is in the minimum temperatures. Pointing to reduced urban aerosols and aerosol seeded clouds as the cause of the urban warming. Log in where it asks you to. At the bottom of the presented list of choices you will see “EBSCO Academic Alumni Edition”. Select that one a and you can select “Academic Search Alumni Edition”. Note that the Alumni edition does not allow you to read all such papers (this one is not available for download, for example) but many are. The point is that if you are a member of an alumni association, you might have access to more papers than you might know, worth checking out. I find the valuation of the UHE very interesting and quite valuable. Now let us apply it to readings throughout America and see where we stand. As for the core temperature rise due to greenhouse gases, this author thinks it is partly due to the decadal oscillation. Since Seoul is so close to the border, alliterate comparisons should be very helpful. So where are they? Ah, yes, 50 million candles burning in Pyongyang. The 0.6 degrees over 55 years corresponds very well with the global 0.1 degrees per decade warming rate that has been observed. And the 0.8C since 1900. The measurement of the UHI in Korean cities has not made that go away. Sorry, the elephant is still in the room. Is that the “Earth’s climate is not in stasis” elephant? I think it used to be a Woolly Mammoth. Why is the Greenhouse Effect twice as strong in Korea? North Korea may be a strange place, particularly in the political area, but I suspect that they just might be open to sharing what information they have if approached in the right way. If they could claim that their contribution was responsible for showing up current Western climate science for the bunch of crap that it actually is, and for putting the world back on the right track, I suspect that they would jump at the chance. Of course, we have no idea at all if they have been keeping temperature records, let alone accurate ones. But as my mum used to say: “There is no harm in asking”. I’d be more likely to believe 0.77°C from UHI effect if it wasn’t stated that “everything else” is attributable to the GHE. As I read this it suggests no natural warming component whatsoever. Hence I’m suspicious of both values. As far as ‘climate science’ is concerned, the “elephant in the room” has always been natural climate cycles. Warmists refuse to believe climate can change naturally – well, to be more precise, they most particularly do not believe it can change naturally right now. Trying to fix climate, which is the warmist goal, is absolutely impossible. Anyhow, the goofy/green politicians are now spending hundreds of billions of dollars trying to achieve the impossible. Returning to the subject of UHI, warmists always insist on underestimating its effect as it causes too many inconvenient aberrations in the pre-determined conclusions of their models. Parker used minimum temperature, which don’t typically occur at night, they occur in the early morning. The Parker studies tells us nothing about nighttime temperatures. Changes in early morning temperatures are largely driven by changes in solar insolation (clouds). So its hardly surprising he found wind had little effect. IMO the Parker studies are based on flawed assumptions and worthless. There are numerous problems with the Parker study. 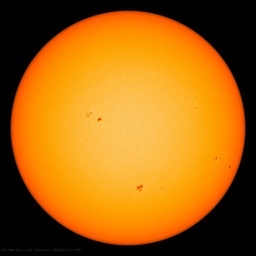 Amongst the largest is they just assume that wind will always decrease night time warming. Most temperature sensors are at airports. Airports are rarely at the center of cities. As such, if the wind comes from the right direction, it could actually cause cause warming, not cooling. They do a poor job of defining “windy”. It is defined as a fraction of the average wind speed for the area being studied. If the moderators wish to delete I understand – it really is off topic! What is in the paper is the genuflect to the religion of CAGW. Remember Tom Lehrer’s Vatican Rag. If you put this sort of phrase in the paper, it makes it that much more likely the paper will be published; particularly as, in this case, it tends to provide evidence against CAGW. A very provocative paper, which uses a good case study of a rapidly urbanising modern economy as the basis for investigation. It is also, however, right by the Pacific Ocean and hence any oceanic effects are likely to be more marked than, say, in Mongolia, Southern Siberia or Western Montana. It’d be interesting to see the ‘national temperature curve’ for South Korea to see if there has been any rapid warming post 1977 which may be affected by PDO oscillations etc. Any chance of getting the authors to contribute a paper which addresses questions readers of this blog site may raise? The IPCC declared that their models proved that urban warming has only increased by temperatures by 0.01 degree C over the last century! Shows how much they know! Divide their other results by 77 and you get close to the truth. I am confused as to why it is not in the past 30 or so years of satellite data…. Of course I have been confused for years as to why you guys have not tried to find the UHI in satellite data anywhere in the world…. Why not just fire up the GCMs and find out whether the clouds result in warming or cooling in the Korean Penninsula. Surely they will tell. 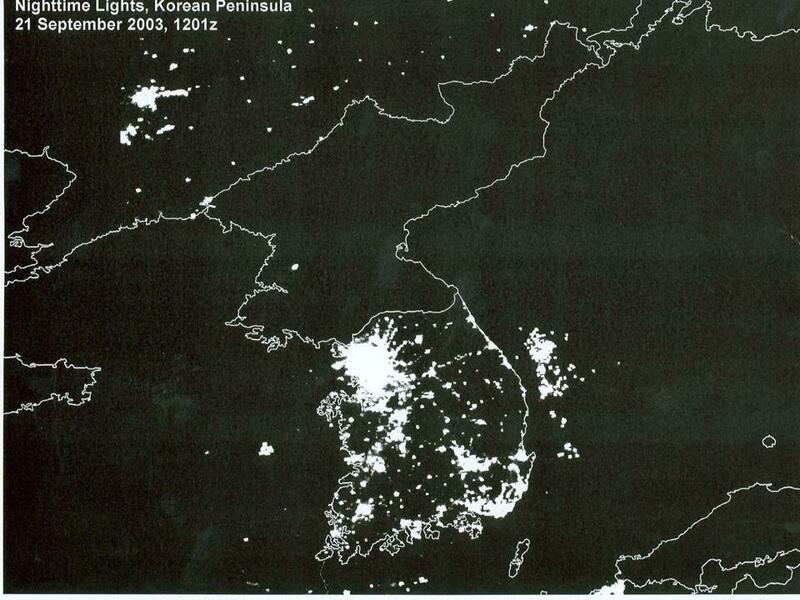 Compare the satellite night time illumination of North and South Korea. Isn’t North Korea pathetic? Makes you wonder what that one white dot in North Korea is? Did Kim Jong Un leave his bathroom light on? I can’t imagine why the South Koreans would be jeopardising their own prosperity by adhering to the AGW mantra. South Korea is a second Japan in terms of rapid industrialisation and modernisation following the obliteration of the Japanese occupation and then the Korean War. A powerhouse that owes its present circumstances to coal and the burning of same. They also have a far greater worry than supposed AGW in the form of a belligerent NK and their proximity to the Chinese. Besides, warmer winters would be beneficial. Has anyone looked for a correlation of temperature trend for night time illumination measurement instead of population density? Why not Google/Bing “north korea surface temperatures? There’s data out there, some of it possibly useful. that’s because you cannot find UHI in satellite data. UHI has a vertical structure. 2. From the roof top to the surface, you have what is called the urban canopy layer. Air temperature here is the air temp that is sampled by a thermometer 2m off the ground. The air temp here is determined by the land surface temperature and horizontal advection. Satellite cannot “see” this temperature. a kilometer or 2 into the atomospere. Above the boundary layer, UHI is all mixed away. at layers above the UBL. good question. The studies are really not caparable. You can’t simply compare a a global study to a regional study. Also, note. What you see here is a increase of .6C over 55 years. Or about .1C per decade in a region that is rapidily urbanizing. In china, we see the same thing, although the rate there is more like, .05C decade. In japan, also rapidly urbanizing you have similar figures. you can see that there may be a GLOBAL UHI trend of somewhere between 0 and .1C decade. on a GLOBAL basis ( Ps we found .04C per decade globally) REGIONALLY, you will see places like Korea, Japan, China, having bias rates higher than .04C. Latitudinally, you will see that rates in the northern hemisphere are higher than the southern hemisphere. 3. whether the study is global or regional or site specific. Pitiful. They correlated with rate of population growth and population growth. How about multiplying by GDP per head? S Korea in 1954 was dirt poor, ravaged by war. I’ll bet there wasn’t much energy use per head. Look at it now. Don’t these people have any smarts? Just sayin’, when you have an industrial economy in a small country, just the burning of the fuel alone can be a significant factor. Or any other numerous potential atmospheric oscillations. RE: DPRK – All one needs to do is count the frozen bodies each year to determine warming or cooling trends. It’s 4deg. F. in Pyongyang as of 30 min. ago. Google Earth weather. Oh, yeah. If we assume blackbody conditions at 10°C for Korea, 3.4 W/m2 converts by SB to 0.7°C of warming in Korea from fuel use alone. “The 0.6 degrees over 55 years corresponds very well with the global 0.1 degrees per decade warming rate that has been observed. And the 0.8C since 1900. The warming phase in the first half of the 20th century had the same slope as the one during the 1980’s and 1990’s. In the 2000s, warming stopped even though CO2 kept rising. So, the Earth is not showing any different behaviour than it did before 1950. The elephant in the room is that all the UNFCCC’s and UNIPCC’s efforts to demonstrate a change in this behaviour have amounted to nothing. The decision puts on hold a major portion of California’s effort to cut greenhouse-gas emissions, at a time when the most-populous state’s stance has taken on extra importance nationwide because of a stalemate in Washington over greenhouse-gas legislation. “It is not surprising that the oil industry is attacking these programs, but like previous attacks in the courts and at the ballot box, we expect this one ultimately to fail,” said Trip Van Noppen, president of Earthjustice, a nonprofit environmental law firm based in San Francisco. Willis, using South Korea’s 81,000,000 barrels of imported oil in a year * 5,780,000 btu’s per barrel * 1055 joules per btu / 365 / 24 / 60 / 60, I get about 16GW average power. I spread that over the 99,260,000,000 square meters to get 0.16 W/m2 (your number seems to be 20x too high). This is an interesting calculation. I’ve done the same for the U.S. and in urban areas the forcing due to energy use (it’s all degraded to heat in the end) is a significant fraction of the observed warming. What cities are all those lights off the South Korean east coast coming from? Why is there so much light in the North West? This is an interesting, if unintended, experiment. It’s nice to see totalitarianism being useful for something after all. The use is not distributed uniformly over Korea. It is concentrated in urban areas. I did the same calculation for just the larger urban areas of the U.S. and found a result that is a fair fraction of the forcing implied global warming. What this study shows is urban warming was approximately double non-urban warming. A different conclusion from the findings is that a local/regional effect causing warming is twice as strong in the urban areas compared to non-urban areas. Hint – reduction in aerosols. That is Seoul–a large urban area right next the the DMZ. KK, use Google maps and zoom in to city level and yes you can see Seuol and a number of other cities/towns in the NW but there’s also lots of ‘greenery’ in between them so why so much light? More importantly when did tehSouth Koreans decide to build all those floating cities off their east coast? KevinUK, squid fishing nets. They use lots of small lanterns. Those are the brightly lit offshore areas. After the first manned orbits in the 1960s, the two brightest areas on our planet were observed to be the Persian Gulf (flaring gas) and the Sea of Japan (squid fishing nets). As I understand the UHI issue, it is not actually a matter of the real heat contributed by cities to the globe, which is trivial, but of the effect of urbanization on temperature measurements, leading to overestimation of nearby/wider temperatures. So is this claimed effect of UHI supposedly a warming of SK as a whole, or a biasing of the readings, which needs to be backed out? warming, however, it’s not been identified as a major contributor in all cases. it depends on the actual configuration of the LCZ. In places like downtown tokoyo anthropogenic heat can be as much as 50% of the effect in certain seasons. You cannot tell simply by looking at national figures but you have to look at the energy used in the vicinity of the station versus other factors. Reductions in aerosols and the consequent reduction in aerosol seeded clouds affects in particular Tmin, especially Tmin in winter. This is because Tmin is sensitive to changes in early morning insolation and in winter the effect is stronger due to the longer period that solar radiation passing thru the atmosphere at a low angle prior to Tmin is affected by the presence/absence of clouds. Tmin occurs later after dawn in winter than in summer. I think you will find that most of the ‘warming’ in S Korea is in Tmin, especially in the winter. Note this mechanism is separate To UHI. The industrialization of S Korea has completely eliminated the domestic burning of coal and biomass which would have been the primary means of heating and cooking at the start of the study period (1950s) and the major source of aerosols. Its a common misconception that industrialization increases aerosols. It doesn’t. It progressively reduces them, primarily by replacing domestic burning of coal/biomass with electricity/gas. First, Eric, thanks for checking my work by running the numbers yourself. It is an excellent habit to have, I commend you and encourage others to do the same. I used the total primary energy for Korea from the BP Statistical Review. It breaks down like this, in million tonnes of oil equivalent. Thus, the oil is less than half of the fuel consumed. So your number starts out low by a factor of 2. Next, according to BP the total South Korean oil consumption is 2,384 thousand barrels per day, which is about 870 million barrels per year. This means that your figure is also low by a factor of about 10. Between the two, your numbers seem to be about 20x too low. They must do an awful lot of squid fishing in South Korea then but presumably the North Korean’s aren’t as partial to squid or maybe they fish for their squid in South Korean waters? Funnily enough I first thought it might be down to flaring so Googled ‘South Korea off shore oil fields’ which didn’t turn up any significant hits, so it does look plausible at least that those off shore lights could be down to squid fishing. Not sure how they look for UHI for HadCrut and Best, but maybe it would make more sense to eliminate any UHI for each set of data first before they extrapolate a temperature for the whole planet? This analysis does not show any difference in rate of temperature increase between the two countries. That’s Seoul and surrounding areas. Now you know why a sabre rattling NK scares them so much. Seoul is within artillery range of the DMZ. GHCN has North Korean data. Also GISS. Most of the series are not updated after 1980, but Pyongyang and some other cities are. While Pyongyang may not be “nights light” urban, it is still a fairly large city. Sorry, KevinUK, for some reason I missed the lights out to sea completely. I see that cgh explained them as fishing fleets. Japanese fishing fleets are quite extensive, and have caused UFO scares when observed from the air on trans-Pacific flights. that is exactly what best have done. it depends. It depends upon the type of aerosol, depends on the winds. when you have some data on Korean and more than speculation, I’ll read.